Senator Dino Melaye has just been granted bail by a court in Lokoja. Senator Dino Melaye has been granted bail in the sum of N10m by a Lokoja High Court, on charges bordering on gun running. Melaye was not present in court when his bail application was heard and granted. The senator was granted bail on health grounds. Justice Nasir Ajana, who ruled on the bail application before a Lokoja High Court on Wednesday, May 16, 2018, said his ruling was on the conviction as submitted by the defense counsel, Chief Mike Ozekhome (SAN). Ajana also ruled that there was nothing to show that the applicant would jump bail if granted one. 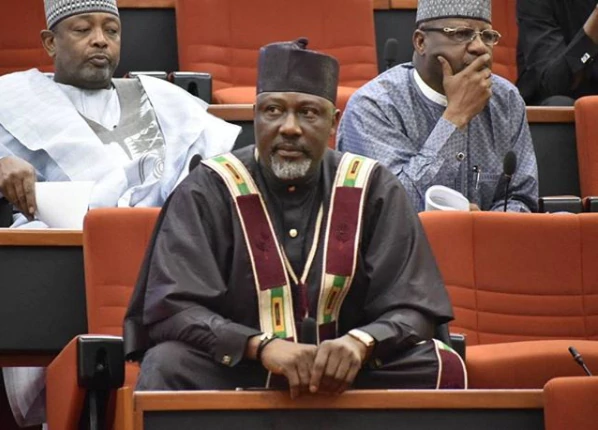 Melaye was taken to Lokoja from Abuja to face charges bordering on damaging of government property, criminal conspiracy, illegal possession of firearms and attempted suicide. On May 3, 2018, Melaye was denied bail by the Senior Magistrate Court 2 in Lokoja, Kogi state and remanded in prison. Melaye was arrested on April 24 and reportedly jumped out of a moving police truck as he was being taken to Lokoja for trial. The senator is reportedly battling asthma and has made court and public appearances from a stretcher. Melaye has been locked in a political battle with his State Governor Yahaya Bello for some time now.